‘Nameless Glory: The Freedom Of Information Song‘ Michel Montecrossa’s New-Topical-Song-Movement Audio Single and DVD released by Mira Sound Germany is a song-prayer for all victims of tyrants in Syria and too many other places. “Nameless Glory: The Freedom Of Information Song is a song-prayer for all victims of tyrants in Syria and too many other places. These brave men gave their life for their strong belief in freedom and a better future. They indeed gave their life for all of us who always should take a stand for freedom and free information in our world. In times of crisis and powerful change towards freedom there is heightened tension between belief and reality and each side is blocking access to free information from the other side. But, really, god is too old a name. / “It is the nameless glory and there is / consciousness and bliss”, she said / and all reflections of her flame-born self / told of mighty hours in our room of change. I said: “Nobody is a liar.” And I asked: / “is there anybody true?” She said: “Nobody is a liar. / If not so, please, do tell me the truth.” / As a wind wrestling through some leaves of autumn she came by. / There was no chance again to stay where all times stage their play. What is it that made us think of man and golden tunes? / Is there something true or real to believe in? / In all this light there was no reason anymore to see anything like that. / And what we are we even were before time had a say. was written in all the games of consciousness bold / and of doubts somewhere in creature’s cold. and to find the ocean and the aim. Freedom of information is the open road / to the true self of humanity, / the power of human genius / and the destiny of human life. 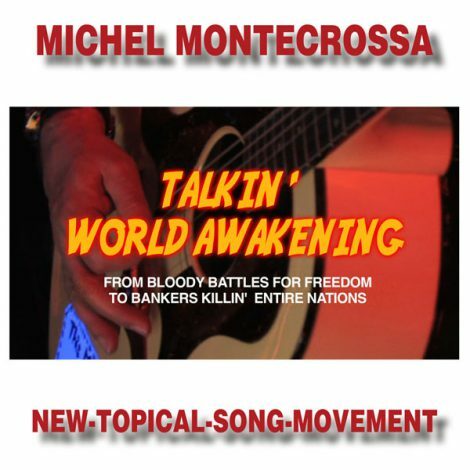 Talkin’ World Awakening‘ Michel Montecrossa’s New-Topical-Song-Movement Audio Single and DVD released by Mira Sound Germany is dedicated to Greece, Freedom and all people sacked by banka-gangstas. Deutschland Ist Grün Für Die Zukunft Von Europa‘, veröffentlicht von Mira Sound Germany, ist Michel Montecrossa’s Deutsch-Topical-Song Audio-CD Single und Musik Video für Bundeskanzlerin Angela Merkel und ihr Konzept einer neuen Architektur der Energieversorgung in Deutschland. “Deutschland Ist Grün Für Die Zukunft Von Europa ist ein Deutsch-Topical-Song für Bundeskanzlerin Angela Merkel und ihr Konzept einer neuen Architektur der Energieversorgung in Deutschland, die zuverlässig, bezahlbar und umweltverträglich ist und als zentrale Säule die erneuerbaren Energien hat. Diese Zielsetzung kann Deutschland durch die Leistungsfähigkeit seiner Industrie in das Zeitalter der risikoarmen, leben- und naturschonenden Energieversorgung der Zukunft führen, die es bislang so in Deutschland nicht gegeben hat. “Wir können als erstes Industrieland der Welt die Wende zum Zukunftsstrom schaffen. Wir sind das Land, das für neue Technik, Pioniergeist und höchste Ingenieurkunst steht. Wir sind das Land der Ideen, das Zukunftsvisionen mit Ernsthaftigkeit, Genauigkeit und Verantwortung für zukünftige Generationen Wirklichkeit werden lässt. On 25.06.2011 Michel Montecrossa and his band The Chosen Few will play the ‘Let’s Go Future’ Climate Change & Topical Song Concert at the Omnidiet Music Hall. “Let’s go Future! Let’s be the big We! ‘Vision & Action’ – 27 New-Topical-Songs and Movies by Michel Montecrossa and Mirakali on Double Audio CD and DVD dedicated to the worldwide awakening to freedom and true democracy presents strong ethical songs of humanity and human unity. The powerful collection includes awareness-changing songs like ‘Living On A Planet’, ‘Cybergeneration’, ‘Family Of Man Song’, ‘Determined & Undeterred’, ‘The Need Of The People’, ‘Freedomfire Burnin’, ‘My Heart Is Bleedin’, ‘Talkin’ End Game – It’s The Radioactive Song’, ‘Besinnung’, ‘In The Street’ and ‘Tree On The Hill’ as well as great songs and movies by Mirakali like ‘Dreambirth’ and ‘Future Earth’ and 16 more down-to-earth reality songs. “My New-Topical-Song-Movement is there to bring to the people the songs that inspire and to bring them fast. To make CDs and DVDs, songbooks, programs, songsheets, concerts. ‘In The Street’ Climate Change Concert with new topical songs, released by Mira Sound Germany as Double Audio-CD or DVD is Michel Montecrossa’s seventh concert of the Future World & Climate Change Concert Tour 2011. Performed in the Science Fiction Rocker Basement in the Michel Montecrossa Rock Vision Diner in Gauting near Munich on 7th May 2011 the concert includes 27 tuff acoustic and electric songs for the people including the title song ‘In The Street‘ and more burnin’ acoustic songs like ‘Nuclear Power Saves Up To Threat Level 7‘, ‘The Dream Of The People‘, ‘Singin’ Future World’ (With The Girl From The Other Side Of The Street) as well as powerful electric Reality Rocker songs like ‘Trouble Double Rocker‘, ‘Overdrive‘, ‘Let’s Be Vulgar‘, the band version of ‘Street Rocker In Syria‘ and the finale ‘Blood In The Abyss, Sweat In The Kiss‘. Diana Antara contributes street-rock-songs like ‘Power Of Dreams‘, ‘Cyberhighway #2‘ and ‘Powerheart‘. Performed in the Science Fiction Rocker Basement in the Michel Montecrossa Rock Vision Diner in Gauting near Munich on 7th May 2011 the concert includes 27 tuff acoustic and electric songs for the people including the title song ‘In The Street’ and more burnin’ acoustic songs like ‘Nuclear Power Saves Up To Threat Level 7’, ‘The Dream Of The People’, ‘Singin’ Future World’ (With The Girl From The Other Side Of The Street) as well as powerful electric Reality Rocker songs like ‘Trouble Double Rocker’, ‘Overdrive’, ‘Let’s Be Vulgar’, the band version of ‘Street Rocker In Syria’ and the finale ‘Blood In The Abyss, Sweat In The Kiss.’ Diana Antara contributes street-rock-songs like ‘Power Of Dreams’, ‘Cyberhighway #2’ and ‘Powerheart’. 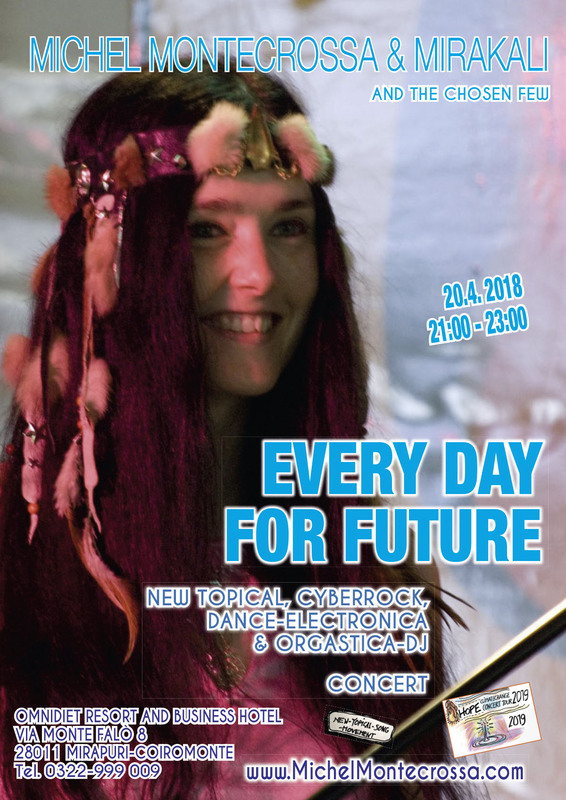 Talkin’ India’ (From Corruption To Ecology There’s Another Side To Everything) Michel Montecrossa’s New-Topical-Song-Movement Audio Single and DVD released by Mira Sound Germany is dedicated to the Future of India and the world. India has a role to play in the world / free from corruption, injustice and suppression, / to be an example for the earth and man of democracy and politics that can. Today it is rich and poor at once / standing on the crossroads of new endeavors / where demons of the past are no longer there but the vision of a continental green tomorrow. horizontal farming and vertical farming / together creating green cities of tomorrow, / wind and water and tidal energies / overcoming food and energy fears. India has a role to play in the world / with clean water and air and wildlife forests, / with pollution control and smart energy consumption / and a democracy showing what it wants. 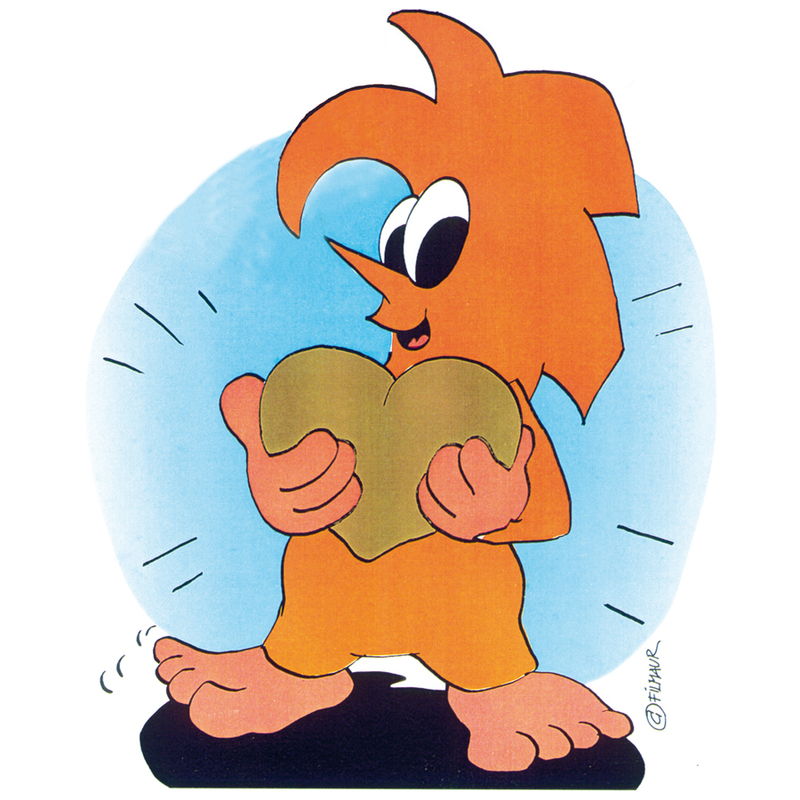 Here’s the Illustration ‘Sinus With Heart’ by Michel Montecrossa.